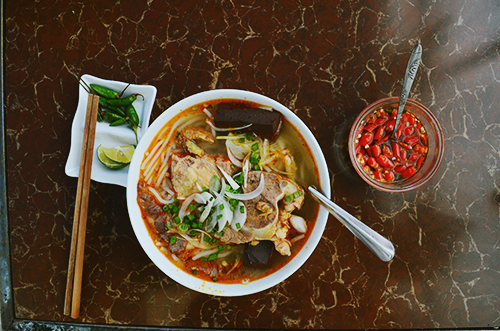 Diners can choose bun bo Hue (Hue–style beef rice noodle soup) or bun rieu cua (Vermicelli with sour crab soup) for breakfast or lunch in the journey to discover the city of flowers. 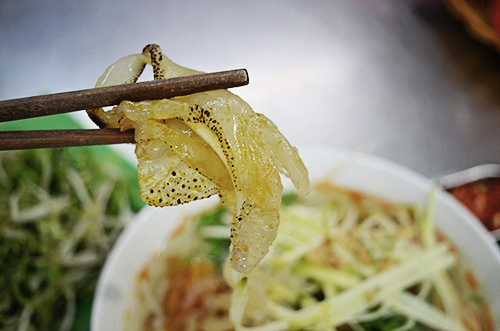 Here are suggestions for people who like to eat hot vermicelli soup (bun) or rice noodles. The restaurant on Ba Thang Tu Street – Dalat opened for more than 3 years but it has been appreciated by many people. 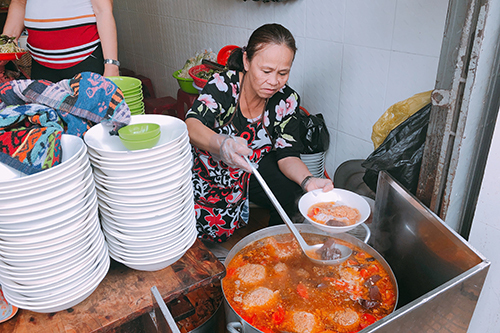 The taste of bun at the shop is a little lighter than many other places, but adding a little chili fish sauce is prepared in a separate way, will make the dish become tastier. The shop is located right on the side of big street so it is convenient for visitors to find the way. The vermicelli is used in moderately sizes. When you eat, you feel its smoothness and stickiness without being bored. Guests can order more vegetables if they like. The restaurant is open early in the morning to noon time. You should go early to enjoy better food. Bun Rieu Cua (Vermicelli with sour crab soup)is not very popular in the city of thousands flowers. Perhaps so, many tourists passing by Nguyen Van Troi Street in ward 1 always want to stop at a popular eatery that has been in business for more than 20 years. This bun shop owner is Mrs. Pham Thi Lan. On average, every day, about 60 kg of vermicelli sells. 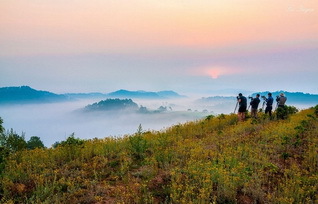 By the tourist season, this number increases steadily. Sometime, there is not enough vermicelli to sell at the weekend. The highlight in vermicelli is a large and well-cooked crab ball with a strong taste. The meal also has a few pieces of pork blood and bones. Ripped tomatoes are characterized by a sour taste that makes the dish tastier and not bored. Guests can choose to have a normal bowl of VND 25,000 or a special bowl adding VND 5,000 more. 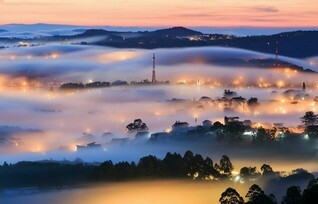 Visitors can choose a no-advertising signs restaurant with 30-year seniority in Dalat. This address is located at the beginning of Nguyen Du Street, facing from Quang Trung Street. In addition to vermicelli, the menu of this eatery also has Hue-style beef rice noodle soup and Quang-style noodles. At the end of Nguyen Van Troi Street – Dalat, the eatery of Mrs. Tra has been open for nearly 6 years. This eatery has many different dishes such as vermicelli with turmeric grilled fish, tuna vermicelli… but the most attractive is the bun sua cha ca (vermicelli with jellyfish and turmeric grilled fish). Things make bun sua attractive customers are the freshness of the jellyfish with the strong flavor of broth. According to the shopkeeper, jellyfish in the eatery is taken from Quy Nhon every day. In addition, the piece of turmeric grilled fish in the shop is fresh, sweet and soft. The dish also has green shredded mango fruit and fatty peanuts, making the bowl of bun sua look more attractive and rich in flavor. The taste of broth is one of the things mark in the hearts of guests. The broth tastes salty enough, the sweet from fish and bones, the aroma of tomato and the spicy of peppers. The dish is served with raw vegetables, if you want to increase the flavor, you can add some chili and lemon sauce. The eatery’s space is simple but polite and clean. Large round tables and plastic chairs are arranged neatly for family or group meals.